I am having free motion quilting withdrawals. I am having muscle spasms in my back and sitting down to quilt is impossible. I have no earthly idea why my back is doing this to me but it's pretty intense. I will have to go to the doctor if this keeps up. But I can stand, so I can work at my computer since it's at counter top height and I can also work at my cutting table. (I also have a good supply of little people who can pick up my pencil and such off the floor, etc.) So I did some design drawing for border ideas on my current quilt. I bought a very large tablet of newsprint so I can work on drawing out some of my ruler work designs and also border designs. That little round thingie was given to me when I bought my first longarm rulers from Quilter's Rule. That was almost exactly 2 years ago at the Mid-Atlantic Quilt Festival, which is this week. (Wish I could go...a mere 3.5 hrs away....maybe I can run off on Saturday!) It is one-half inch wide in diameter and it is so you can draw with the rulers just like you would quilt; a quarter of an inch away from the ruler. This helps when planning designs and placement markings. I've been afraid to peel the protective paper off, thinking it would be very easy to lose. But I did need to be able to see through it. So I put some nail polish on it! My daughter approves. The ruler is one of Accents in Design's Fine Line Rulers. The above design was dismissed, though it's got some neat elements to it. Spent a bunch of time on the above design only to decide there was too much crosshatching. And then in a flash, the below idea came to me. I sketched it out as quick as I could, before it fell right out of my brain. Now I will need to give it a full page in my big notebook and figure out the spacing, marking, and feather placement. Not sure what to put in that inner curved area above the feathered swag. 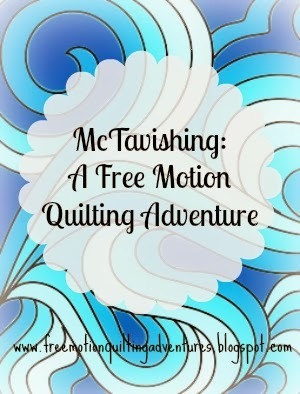 Maybe McTavishing? Which leads me to Amy's Free Motion Quilting Adventures very first quilt-along, dubbed the McTavish-along. The first post and link up will be this Monday and will continue every Monday of March. Come join us! There will be plenty of information and videos for this great design. We will share our progress with McTavishing, visit the blogs of other participants, and there will be at least one give away!!!!! Don't miss this fun series and the giveaway! Follow the blog with your method of choice. There are several easy ways to do so by clicking one of the follow methods on the sidebars. I am so excited to host my first link party and a giveaway with product from a sponsor! I'm linking this post with Connie's Linky Tuesday at Free Motion by the River. Go join in the party and visit some great blogs! I hope your back starts feeling better soon but in the mean time you are really accomplishing a lot of beautiful designing!! Thanks for sharing. McTavish-along sounds like fun, is it only for longarms? This has too much information to miss....my friend sent me your link; I am signing up to follow via GFC...thank you!!!! Well, thank you and thanks to your friend! Have you been sitting in one position too long? I have to force myself to take breaks because of back spasms. Set a kitchen timer for 20 mins and when it goes off....stop and stretch and move around. Can't wait for the McTavishing event!!!! Maybe more like not being in one place long enough. Very busy season of my life (Lord, I hope it’s just a season) and I’m not getting good sleep and tossing and turning when I do. (Maybe I tweaked something as I slept?) It definitely wasn’t the usual tense upper back and neck that comes from too much time quilting or sitting at the computer, nor the low back strain I’ve had before. Whatever it was, it’s gone now and I am grateful. Thanks for your concern, and I am so ready for our McTavish-along!